Having worked in fashion before becoming a writer, (I started at Vogue the same day Anna Wintour did) I have always loved clothes. Back in the day I was lucky enough to have had a wardrobe allowance from Donna Karan and my pre-motherhood clothing budget was a lot bigger than it is today. For my 'Lunch' column, every week I sit across the table from some of the world's most successful people while trying to ask them interesting questions, write down their answers and eat -- all at the same time. The last thing I want to think about (besides whether or not I have food in my teeth) is my appearance. That's why I love #Talbots. If you haven't checked them out in a while, you need to. 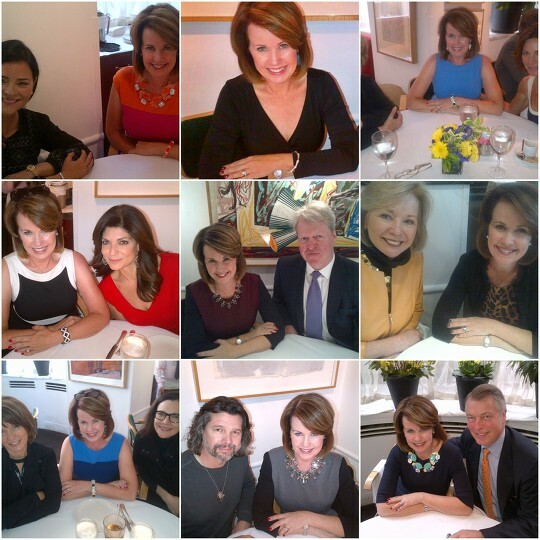 Their dresses are my absolute favorite -- and I've pretty much worn them for every big interview I've done. Their colors are great, they fit me perfectly and they're affordable enough that I can buy multiple styles every season. (Please don't tell my husband) I just scored three dresses at their Red Hanger Sale -- all for under $200. Their regular priced styles won't break the bank, either. This collage features some of my favorite styles that I've worn when interviewing Outlander's Diana Gabaldon and Ronald D. Moore, Charles Spencer, Tamsen Fadal, Kathryn Leigh Scott among other famous faces. Thanks Talbots for making me look as good as I feel in your dresses!